The qualities of natural fresh water that can be detected by human senses are derived from various naturally occurring chemical, mineral, and bacterial sources. These constituents affect the way in which the human senses of sight, smell, taste, touch, and hearing perceive water and judge its aesthetic quality. Other qualities that humans can experience (temperature, sound) are the result of physical processes such as the movement of water. Although artificial modifications (e.g., filtration and softening) can improve water quality for human uses, and human impacts can decrease quality, this discussion is limited to naturally occurring substances in fresh water that determine the way humans "sense" it. "Apparent color" is derived from the presence of suspended solids in water. Insoluble oxidized iron (rust) can give water a red tint, manganese oxide causes a black discoloration, and a combination of the two can yield a yellow-brown hue. The suspended components not only give color to the water itself, but also discolor household sinks, toilets, and bathtubs. Clothes laundered in highly mineralized water also become discolored, most often from the iron that precipitates from the water, yielding small reddishbrown particles (iron oxide) that cling to clothes fibers. 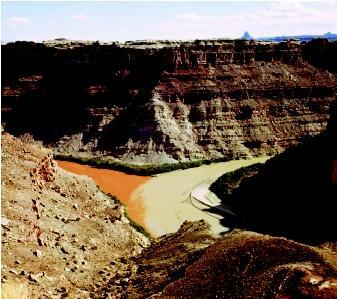 The varying colors of the Green River (right) and Colorado River (left) derive from the suspended mineral sediments carried by the rivers' currents. The name "Colorado River" comes from the Spanish Rio Colorado which means "Red River." This photograph was taken in Canyonlands National Park, Utah shortly after a storm, which enhanced the contrasting colors. Coloration of water in streams often reflects the nature of the sediment suspended in the water. Streams that flow off of recently glaciated areas often appear milky or chalky in appearance. One example is the White River that runs off the eastern flank of Mt. Hood, Oregon. Its color is a result of the very fine-grained sediment from rocks that the glacier has ground up as it moved over them. The term often applied to these glacial sediments is "glacial flour." One of the most common river names is "Red River": for example, the Red Rivers of Louisiana, North Dakota, Tennessee, Minnesota, TexasOklahoma, and Colorado. These rivers all derived their names from the suspended brown to red sediment that they carry, particularly during high water levels. The "true" color of water is the color perceived after it has been either filtered or centrifuged to remove suspended solids, leaving only dissolved substances. The presence of dissolved constituents, such as iron, manganese, and copper, can produce striking blue-green colors in some lakes, hot springs, and streams. The dissolved color obviously differs from the color produced by the suspended particulate forms: for example, the color of suspended iron and manganese particles are brown-red to black. The dissolved ions are derived from the physical and chemical breakdown of the rock during weathering . The minerals of the rock are dissolved, releasing ions into the water that transports them away from the site. 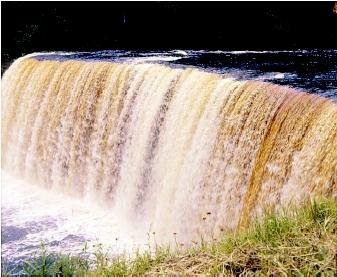 Tahquamenon Falls in Michigan's upper peninsula is known for its "root beer" color. The brown coloring comes from tannins leaching into runoff water from tree roots and decaying vegetation. The colored water eventually reaches the Tahquamenon River. organic odor. This coloration is common, and can be observed in places like swamps or stagnant ponds. A person can produce it by placing some leaves in a bucket of water and letting it set for a few weeks. Algae can grow in lakes, streams, canals, and even in wells and water pipes. This growth can produce hues varying from a pea-soup green to a reddish brown. At high concentrations, algae can produce an unpleasant "pond scum" that can reduce consumer confidence if the water is used as a source of drinking water, and can clog pumps where the water is used for irrigation. Algal blooms also can degrade the visual appeal of a waterbody, and negatively affect its ecology by consuming dissolved oxygen as the algal mats decay. In some cases, the decay produces a bad odor which results from the release of methane gas. The common taste-causing compounds include both inorganic and organic chemicals. Hydrochloric acid can produce a "lemony" flavor, and in volcanic terrain one can find "lemonade springs" where naturally occurring hydrochloric acid has impacted the water quality to the delight of passing tourists. Sodium is another common inorganic substance that, when dissolved in water, can affect its taste. Ocean water contains significant amounts of sodium, and salt-water intrusion is a major concern in many coastal areas. Salt-water intrusion is often caused by excessive pumping of water wells on land, drawing sea water into the aquifer . Hydrogen sulfide gas dissolved in groundwater is a harmless contaminant, but produces a "rotten egg" odor that water consumers usually disdain. The odor results when well water is exposed to the atmosphere and the dissolved gas escapes into the air. fresh-water aquifers, and it is common for deep water wells to suddenly encounter salt water. This is a common occurrence in oil fields because oil is almost exclusively found in old sedimentary rocks. If oil wells or other deep wells are improperly constructed or abandoned, connate water may contaminate fresh-water aquifers. In groundwater, several types of bacteria are common causes of aesthetic concerns. Iron bacteria, which live on the oxidation reactions of iron and manganese, are common in wells that are drilled into an oxygen-depleted aquifer. These bacteria can create a slight musty taste and discoloration, and excessive growth can lead to gelatinous slime growth in well casings and on fixtures. Water consumers particularly notice the discoloration against their white sinks and toilet bowls. Sulfate-reducing bacteria are common in groundwater that lacks dissolved oxygen. Their growth results in the chemical reduction of sulfate (SO 4 2− ) producing the most common odor-causing substance in groundwater: hydrogen sulfide (H 2 S) gas. This gas produces a "rotten egg" odor that humans can detect at very low concentrations. Most people find the smell objectionable at concentrations well below those that would pose a health threat. Naturally carbonated groundwater in wells or springs have been found in many areas, such as Saratoga Springs in the Hudson River Valley of New York and Manitou Springs in Colorado. Carbonated water results when the groundwater carries high concentrations of dissolved carbon dioxide (CO 2 ), often in the form of bicarbonate (HCO 3 − ). Typically, these springs are found in areas where abundant limestone is found beneath the surface. The principle mineral in limestone is calcite (CaCO 3 ) which yields CO 2 when it dissolves in water. Excess "hardness" is a common complaint among consumers because it may affect not only the taste of the water, but also plumbing systems, cookware, and other household items that come in contact with the water. The major elements that contribute most readily to water hardness are calcium and magnesium. A unit of hardness is expressed in milligrams of calcium carbonate (or equivalent) per liter and defines how well the water lathers with ordinary soap. This factor also lends to the "feel" of the water while bathing and washing. "Soft" water (low calcium and magnesium content) will lather readily, whereas hard water requires more soap to produce the same amount of suds. Before producing suds, the minerals causing water hardness must be removed from the water by combining with the soap. The result of this reaction is a white mineral deposit (e.g., scale in pipes and fixtures), often recognized as a ring around the washtub. Individuals living in a hard-water area find it necessary to periodically flush out their water heaters, treat their coffee makers, and so on. Therefore, hard water (with more than 75 milligrams of calcium carbonate per liter) is undesirable for most household uses, and water softeners are installed to reduce the hardness. 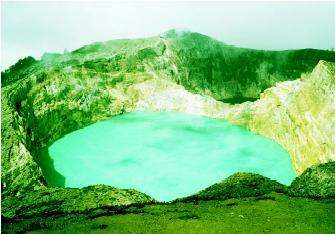 A combination of dissolved and precipitated minerals leads to the turquoise-green color of this crater lake on Kelimutu Volcano, a popular tourist location on Flores Island, Indonesia. The water's high temperature (approximately 37°C [about 100°F]) and extreme acidity (pH less than 1) helps dissolve Earth minerals. The color of this lake and its two nearby "sister" lakes (also located on the summit area) is in constant flux, perhaps owing to changes in magma activity. effects are also associated with these secondary compounds. Hard water can adversely affect industrial applications, and under certain conditions manganese can be toxic to some crops. While most of these constituents make water unpalatable before causing illness, sulfate can act as a mild laxative. At high enough concentrations, the compounds can cause symptoms resembling more serious pathogenic intestinal disease. Pure water has no taste, as one can attest by drinking distilled water. It is the type and abundance of dissolved constituents that give waters their individual tastes. Most people consider waters with low concentrations of dissolved minerals to taste "good." However, concentrations that are too high can lead to problems. With more dissolved solids, the water takes on a "salty" or "mineral" taste. Most individuals begin to notice this taste when the dissolved solids concentration reaches 250 milligrams per liter. Rainwater, snow, and other forms of precipitation have very low dissolved mineral concentrations; consequently, most streams and lakes have low mineral concentrations and therefore are naturally soft. Hence, in the absence of algae or other organisms, their waters have a pleasant taste. Groundwater that has resided in the subsurface for only a short period of time, or is in rocks that dissolve slowly, contains low quantities of dissolved minerals; consequently, it tends to be naturally soft and has a "good" taste. Only groundwater from soluble rocks or that have been in the subsurface for a long time have dissolved enough calcium and magnesium from the rocks, or streams or lakes fed by such groundwater, tend to be hard. Lakes, streams, and groundwater can occur at widely varying temperatures. Swimmers may experience the contrast between the sun-warmed surface of lake versus the cold hypolimnetic waters below. Streams flowing from a glacier can be considerably colder than a lowland brook meandering through a meadow. Groundwater, which typically is fairly constant in temperature, can be heated to above its boiling point in volcanic areas where hot rocks exist below the surface (e.g., Yellowstone Park, the Cascade Mountains of the Pacific Northwest, and the Basin and Range province of the western U.S.). If the heated water emerges in a desirable location, it may be enjoyed by tourists seeking a relaxing natural sauna. A babbling brook, raindrops on a roof, and gently falling water produce sounds that most people find soothing. Yet the roar of a rushing flood torrent or the thunder of a massive waterfall can instill fear or discomfort. A dripping faucet can annoy. The faint popping of bubbles in naturally carbonated well water can amuse. All these sounds combine with visual, taste, odor, and touch to complete the "water experience." SEE ALSO Algal Blooms in Fresh Water ; Fresh Water, Natural Composition of ; Fresh Water, Natural Contaminants in ; Groundwater ; Hot Springs and Geysers ; Mineral Waters and Spas. Millichap, J. Gordon. Is Our Water Safe to Drink? : A Guide to Drinking Water Hazards and Health Risks. Chicago, IL: PNB Publishers, 1995. Roscoe Moss Company. Handbook of Groundwater Development. New York: John Wiley & Sons, 1990.